Somewhere in the mist on Cairn Liath, east of Creag Meagaidh, I reached halfway on the Scottish Watershed. Since Ben Lui the weather has been mostly wet and windy with low cloud on the tops. 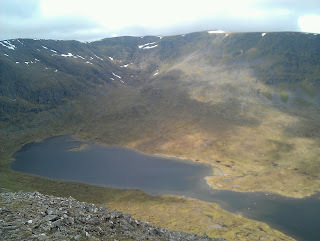 Only occasionally has the sky cleared, as on Beinn Bheoil, from where I took the photo of Ben Alder above. The wind has been northerly and cold too. In the mist my compass has seen much use. A bonus though has been a lack of midges. I expect this will change! I'm now in the Great Glen preparing to head west into Knoydart. The next four days are forecast to be stormy after which calmer, very warm conditions are meant to prevail.